The fall season is upon us and even though in Naples there are no changing trees or cold temperatures (thank goodness…I don’t like cold weather), the tastes of fall are everywhere. I love the use of cinnamon & nutmeg mixed in with all of these fall treats. I do not like at all the gross cinnamon brooms that they place outside of the grocery stores…bleh…they smell totally gross. But, cinnamon in my food, is a okay. Some of my favorite fall treats include my Homemade Pumpkin Cookies with Penuche Frosting, Pumpkin Bread, Pumpkin Spice Lattes and Pumpkin Donuts…just to name a few. For the sake of this review, I am going to review the Pumpkin Donut from Dunkin Donuts. My homemade cookies do deserve a review as well and when I make some, I will certainly do so. But, for now, let’s focus on the Dunkin. I make trips to Dunkin Donuts for breakfast a few times a year. Taylor likes when they have the ‘decorated holiday donuts’ so, I usually plan my trips around that. I always regret after I have Dunkin Donuts because I eat entirely way too much and get on a horrible sugar high which results in a bad stomach ache. This is my own fault. Rather than eat like a normal person, I totally pig out. I always love visiting during fall because the Pumpkin Donut comes out to play. The Pumpkin Donut is a cake donut with a slight sugar glaze. The donut has the deep orange/rust color that is always associated with pumpkin flavored items. I always visit the same Dunkin Donuts and have never had any issues with the taste/freshness of their items. I normally order two Pumpkin Donuts…one to eat right away and one to save for later. The donut has all of the fall smells coming from it right away. When you break open the donut, the moist, cake-type filling releases its smells of fall. The filling is so moist and the glaze provides just enough of a ‘hard shell’ for the donut. The flavors your mouth receives when you eat the donut, taste exactly how it smells. The hints of pumpkin, cinnamon, nutmeg, sugar – fall – all come blasting into your mouth with every bite. The Pumpkin Donut is one of those foods that tastes exactly how it smells. I love the combination of flavors and the soft texture of this donut. I am glad that Dunkin Donuts didn’t go crazy and add filling or extra sugar on top. This donut is perfect just the way it is. I love this donut either right from the store, warmed up in the microwave, or cold out of a Tupperware in the refrigerator. In my eyes, you really can’t go wrong with this donut. Overall Rating: 9/10. The donut loses one point because it is not available all year long. Dunkin Donuts gets a bad rap from a lot of people but, for someone who doesn’t have ‘custom’ donut shops around the corner, I think Dunkin makes some pretty good donuts. When fall comes, I always know that I will be stopping by to get my Pumpkin Donut fix. 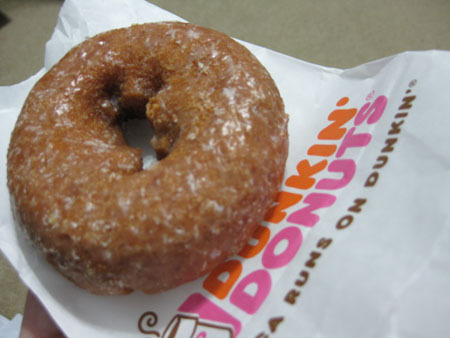 If you are looking for the taste of fall all combined within one item, go with the Pumpkin Donut from Dunkin Donuts. This donut is just simply so delish and reeks of fall.